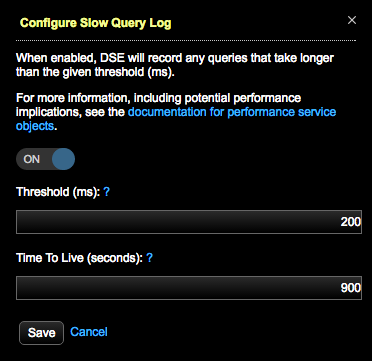 Configure the slow query log parameters in the Performance Service. 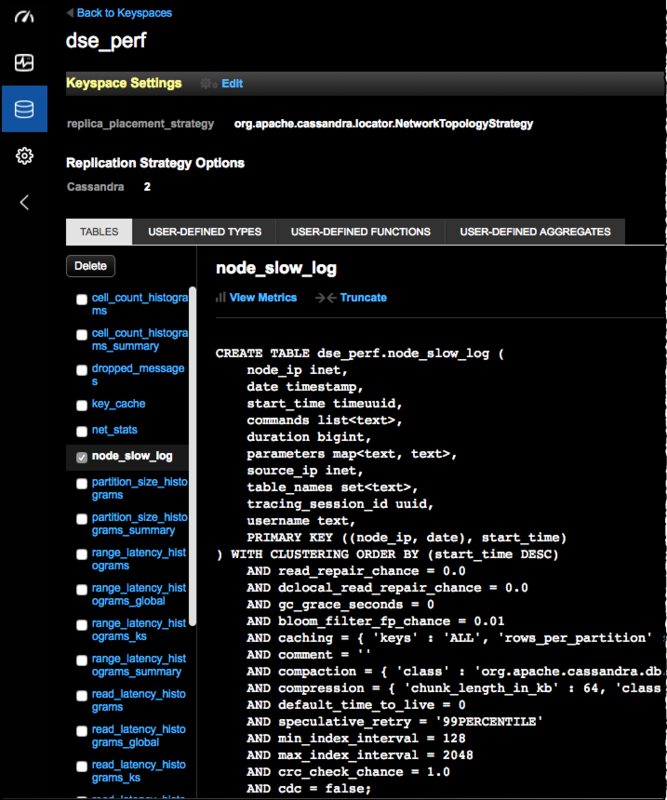 Examine the slow query log to identify and track queries that take an excessive time to execute. Slow queries are candidates for performance optimization. When the slow query log is enabled, OpsCenter records any queries that take longer than the allotted threshold. Note: Review and if warranted, update the default replication for dse_perf keyspace. The default value might need to be increased. Click Data > dse_perf keyspace > Keyspace Settings Edit. Click the Configure or Details link as appropriate for the Performance Service. Click the Configure link for the Slow Query Log. The Configure Slow Query Log dialog appears. Click the button to the On position. Optional: Enter a Threshold value to override the default (200 ms). To prevent excess overhead, the threshold must be higher than 15 ms. Queries that take longer than the allotted threshold value are recorded in the node_slow_log table in the dse_perf keyspace. For information about each column, see CQL slow log table. For more information about collecting and exporting slow queries using CQL, see Collecting slow queries. Optional: Enter a TTL in Time To Live (TTL) to override the default (900 seconds). The TTL indicates the amount of time to wait before automatically deleting the record of the slow query from the database.